A Dallas police officer who fatally shot a black man inside his own flat, saying she confused it for her own home, has been fired. Amber Guyger "engaged in adverse conduct when she was arrested for manslaughter", police said in a press release on Monday. 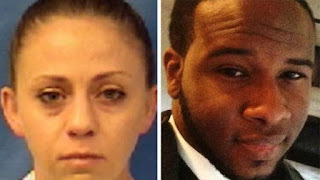 Botham Shem Jean died on 6 September, after Ms Guyger entered his home in the building where they both lived. Ms Guyger, 30, is currently out on bail, pending a criminal trial. Dallas Police Chief U Renee Hall terminated her employment during a hearing on Monday, police said, adding that she has the right to appeal. She had been on administrative leave, as activists called for her immediate firing. Court records show Ms Guyger had just finished a 15-hour shift when she parked in the wrong garage before making what was apparently a tragic error. Ms Guyger entered the apartment after finding the door ajar, and saw Mr Jean, 26, in the darkness as a "large silhouette", according to the arrest warrant affidavit. She said she gave verbal commands that he ignored, so she fired her weapon. The arrest warrant affidavit, written by the Texas Rangers, differs slightly from the search warrant affidavit by Dallas police, local media report. The search warrant statement says Mr Jean "confronted the officer at the door". Neither document specifically states how close Ms Guyger was to Mr Jean when she shot him.